This has become a very much problem for many guardians that the teacher of the many schools are checking the copy carelessly and not writing the answer of the questions properly. Maximum answer does not remain "to the point". Question1-why is the slope of the land important for rivers and streams to flow? Answer- water always flows from high land to low land. 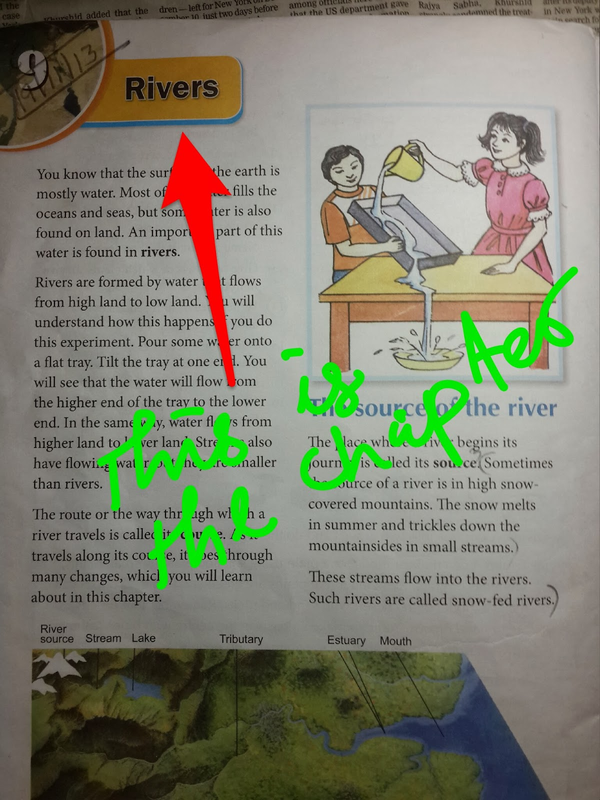 So the slope of the land is important for rivers and streams to flow. Question 2- what are the beginning and end of a river called? Answer- the place where the river begins its journey is called its source and the place where river ends is called its mouth. Question 3 - How is a snow-fed river different from rain -fed river? Explain in two or three statements? Answer- a)Snow-fed rivers formed with melting of snows of the mountains, Where as rainfed rivers are formed with streams produced by heavy rain on the the hills. b) The source of snow fed rivers are the snow of tge mountains where as source of the rain fed rivers are the rain water. Question 4- name two tributaries of Indus and the Ganga. Answer- 2 tributaries of the industry are the Zaskar and the Bees. Two tributaries of the Ganga are the Yamuna and the Soon. Question- why does a river flow more slowly once it enters the plane? Answer- The river flows more slowly when it enters in the plain because the plains are flat and water becomes heavy with mud and sand that it carries down from the mountains. Answer- Fine sand, clay or other materials carried by the rivers and deposited as sediment is called silt. It is very fertile for growing crops. Question- Give five important ways in which rivers are useful for us? Answer- rivers are useful to us in many ways. a) They make smile very fertile with cells during flood. b) Rivers are a good source of fish. c) River water is used for washing and drinking. d) River water is used to water crops during draught. e) Reverse helps to produce electricity. Question- Write few sentences to explain why the flooding of river can be good and bad for people. Answer- flooding of the river submerges its neighbour area and makes people homeless. Thus it is bad for us. But flooding covers the plane with silt which is very fertile and helpful to the farmers for growing crops. Thus it is good for us. Question- How are waterfalls caused? Answer- When river flows through mountains it sometimes fall over steep slopes, then waterfalls are formed. What is the difference between the southern plateau region rivers and the northern plateau region rivers ?